Working online is just awesome. You meet a lot of people and you never stop learning from them. Also, the more time passes, the more you realize that you need to keep studying, reading and searching for new resources to use in your online journey. In this post I present you three tools you should take a look as a blogger or internet marketer : Oktopost, TrenDemon and MyBlogU. Oktopost is a powerful social media management platform, created especially for B2B marketers and with particular attention to LinkedIn. Before you purchase any plans, you can do a completely 30-days free trial. After you sign up (no credit card required for registration), you can begin using all the features available. You may want to start your first campaign, scheduling posts via your social media profiles and then measuring the results. A nice feature is the “calendar tab”, which allows you to control all the scheduled posts with your different social media accounts. Just select one to erase or modify the item with a drag and drop functionality. There is a “content curation” section, which presents you suggested articles around the web, that you can share to your audience with just a click. The “reports section” gives you analytics tools and it will be available once you being generating clicks on your posts links. The “conversion tracking tab” lets you not just measures visits, social signals or comments, but also checking the conversions coming from your social media posts. As mentioned before, Oktopost has particular functionalities for LinkedIn, the popular professional network. In an easy way, you can publish and share your content on multiple LinkedIn Groups at once. You can choose which profiles to post to and verify what is the most noticed content. I like a lot the feature to auto-post on LinkedIn Groups. I believe this functionality makes Oktopost stand out from competitors. Also, if you need help understanding any section of Oktopost, you may want to take a look at the “Knowledge Base” and research the answers by topic or keyword. Additional information can be found at community forums, or you may request help directly to Oktopost staff via email. 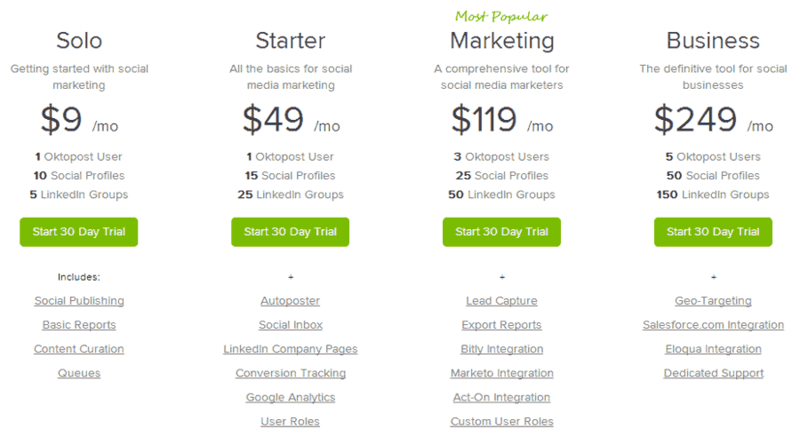 Prices are similar to Buffer, but Oktopost’s basic plan gives you unlimited posts, while Buffer offers you just up to 200 scheduled posts. The “autoposter” feature comes with the “starter” plan, at $49 per month. Oktopost can be a great solution for your social media marketing, most of all if you are a professional. The auto-posting and advanced message scheduling features are great. I also particularly liked the analytics and interface, which is simple to use also for new marketers. 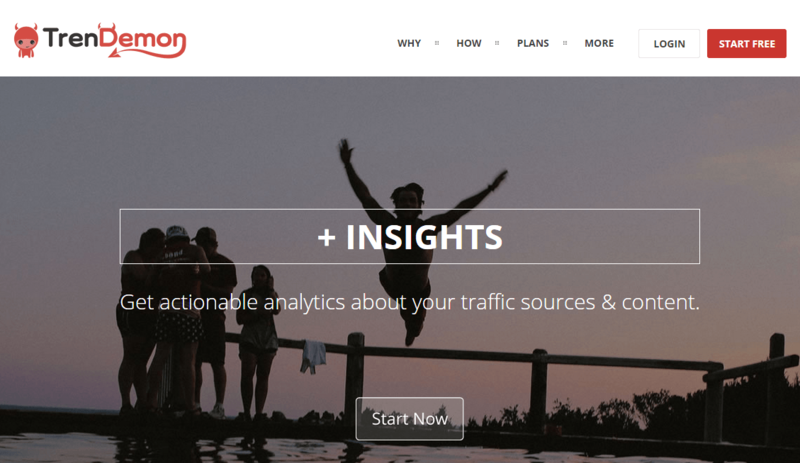 TrenDemon is a new tool to create more revenue and conversions from your content and traffic, automatically using personalized content recommendation and call to actions. After you sign up (free), you just need to place the script code given in every page of your website, or simply grab the WordPress plugin. After installation, TrenDemon will analyze your site and start showing content recommendations to your audience. The longer Trendemon will stay in your website, the better recommendations it will be able to produce (the script is loaded asynchronously and won’t slow down your site). After a couple of hours from installation, TrenDemon will find which articles have the highest impact on your site. Then using the “autopopulated content” feature, you will be able to generate more traffic to those posts or pages automatically. 1 – LIFT – for increasing traffic on your website with personalized content recommendations. Good to improve page views and decrease bounce rate. 2 – PLAY – for boosting social signals and traffic via the gamification principle. You may personalize behavior, color, icons, texts and layout of TrenDemon’s units to match your website theme or simply your likes. TrenDemon is not just a simple “Related Posts” plugin, as its complex algorithms finds the most active pages on your site, and helps you make the most out of every visits. You may want also to set up Call to Actions to improve conversions. TrenDemon is an interesting new tool I want to keep testing on my niche site. Also, eligible publishers will be able to monetize their blogs on TrenDemon Media Exchange from sponsored content. Take a look to the user guide here. I’ve been using MyBlogU since few months already with pretty nice results. I’ve also recently written a complete review of this platform, sharing my experience. In a few words, after you sign up, you can choose among the three main tabs available : “Brainstorms”, “Interviews”, and “Media”. I can tell you I’ve just experience with the interviews section. I participated to the projects of six MyBlogU different users and I’ve been accepted from all of them. This means I’ve been published in 6 diverse websites, with a link back to my blog. Just browse among the topics available, select the ones you are expert about and then simply share your knowledge by leaving your answers to the users project questions. Recently, MyblogU introduced a nice new section where you can be featured as a writer. Interesting to reach more audience! I hope this post will help you to decide if these tools could be useful for your online activities. I am sure that not all of you already know these three resources. Sometimes you just need to use the right tools to save time and improve your productivity. Have you ever used some of the resources mentioned in this post? Awesome tools you posted. I thought, all the three tools are paid. Nice to see free tools also. Part time bloggers with no regular income can’t afford pro tools. I have heard about the last tool only from Ann Smarty Mam’s blog. Enstine Muki sir also created a tool, broaded.net. I think it is similar to trendemon, isn’t it? Is there any social automation free tools available? Thank you so much for this post. Looking foraward for more. glad you liked the post with the information about these awesome tools. I already know BroadedNet, thanks for mention it. Thanks fo the 3 tools. I head about fist and last tool but not about “TrenDemon”. I think i gonna ty this. glad to have you introduced a new tool. Hope it will help you improve your website! I have found your blogpost link through Aha community. Its a great post. I have never used these at all but now I am thinking to try at least once. And now also reading their review by you. be sure to try these tools and let me know your experience. Sure sir, I have planed to use one of them in 2015. And surely share my experience with them. Actually I am using blogger platform. Can you please suggest me one best that can work also on blogger platform. TrenDemon is an ultimate tool to boost conversions as well as revenue. You shared an ultimate step-by-step to get started with it. Thanks a ton for it! glad you liked TrenDemon presentation! Be sure to try it and let me know how it goes. Nice list of blogger tools. I am using myblogu, it is really a great tool. Will try other 2 too. Glad to see you learned a couple of new tools here. 3 out of 3 tools are new for me. I check all tools, among them trendemon look very unique to me. Its not only a related post plugin It have some unique feature that I love. Glad you learned something new here today, Md. Hamim. Thanks for introducing with these great blogging tools. I just sign up in Myblogu and hope this will make my blogging journey better. I’m sure it will, Manik. It’s a great way to increase your audience and online authority, by being featured on other users blogs, sharing your knowledge. I am very much interested in Trendemon now. Going to check it out for sure. You are a wizard too, you keep on introducing so many new tools and recommendations.. I hope you had a great new year. Good luck for all your websites. Take care. so glad you liked the information about these new tools. Have a great beginning of this year. All these tools: Oktopost, TrenDemon, and MyBlogU are quite popular in blogging. But most of the bloggers like me are still unknown from these tools feature. I found this article super helpful for me and got lots of info from here. Thanks for your kind words, Amit. Thats really nice information buddy. it saves a lot of time while doing social media marketing. Thanks for sharing your experience with us, Jon. Excellent article and love Oktopost. For $49, it is really good! Love that to be honest and 15 accounts is definitely a killer. Great list and going to try the second one. Sounds tempting! Magnificent article and adoration Oktopost. For $49, it is better than average! Love that in all honesty and 15 records is certainly an executioner. Extraordinary rundown and going to attempt the second one. Sounds enticing! Give it a try and let us know your feedback, thanks Rahul! Glad you liked the introduction of these resources. Hope they are going to help you in your blogging journey. TrenDemon is the best one… I love it. Thanks for your feedback, Abhiram!